Align Your Employees′ Skills with Your Corporate Objectives by Building a Corporate University! The Corporate University Workbook gives you everything you need to create an effective, systematic learning infrastructure within your organization. As a result, you will develop employees who are capable of adapting to rapid changes and who deliver the results your business needs! This resource offers a dynamic combination of practical methodology, best practices, and step–by–step guidance. 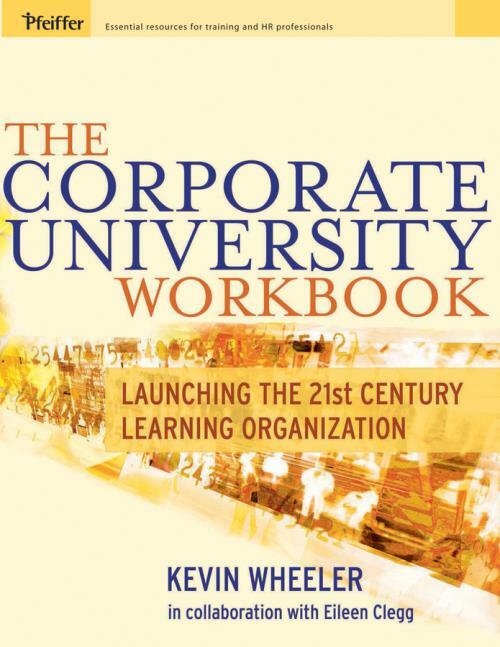 The Workbook, along with the Companion Website, are filled with the tools, templates, and activities you need to develop and implement a corporate university. In addition, this important book offers trainers and HR professionals the information needed to overcome mistakes and avoid common pitfalls such as simply renaming the training function, focusing too much on curriculum, failing to get senior–level management buy–in, failing to adequately market to internal participants, overemphasizing technology, and empire building. The Corporate University Workbook will be your hands–on resource for creating a training and learning environment today that will increase your organization′s ability to meet its business goals tomorrow. "This is a great read for learning professionals. It provides practical, usable strategies and approaches for enterprise learning." List of Tables, Figures, Templates, Exercises, and Survey. 1 The Value of a Corporate University. What Is the Value of a Corporate University to Your Organization? Support for Your Corporate University. First Steps Toward Creating Your Corporate University. 2 Planning the Corporate University: Strategy and Direction. Strategy Is Fundamental: Form Follows Function. When Do You Use These Approaches? 3 Determining the Scope, Stakeholders, and Operating Principles. Determining Your Scope, Stakeholders, and Operating Principles. 4 Governance: Who Decides What? 5 Organizing the Corporate University. Sharing the Decision: The Role of the Governance Committee. 6 Staffing the Corporate University. The Roles of the Corporate University Staff. Five Steps for Building Your Staff. Staff Competencies for Your Strategic Direction. Assessment of Your Current Staff. 7 Funding the Corporate University. Choice of a Funding Model. 8 Performance Analysis and Development Delivery. 9 Marketing to Build Brand, Relationships, and Success. Action Steps: Before the Launch. Action Steps: Marketing After the Launch. 10 Metrics for Measuring Success. Six Keys to Making Measurement Work.